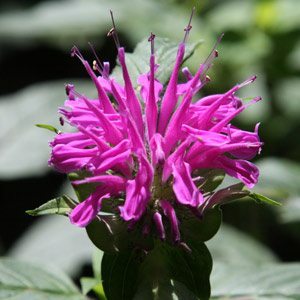 Monarda ‘Donner Wolke’ and ‘Jacob Kline’ are two varieties of the plant that we commonly call Bergamot or ‘Bee Balm’ that we grow. The species Monarda are a group of perennial plants that are well suited to the garden border. Drought tolerant, attractive flowers, and some of the best plants for attracting butterflies and bees to the garden, a number or varieties and cultivars are available. Grow these perennials in a sunny position in a humus rich well drained soil, they require little care other than removing spent flower heads to encourage a second flush and then cutting back in the winter as the foliage dies back. They will form a clump that can be divided in early spring as plants come back to life. We like to fertilize with a seaweed based fertilizer combined with some liquid worm tea, some mulch to get the roots cool in summer is also beneficial. Although Monarda cope with part shade, flowering will be a little less spectacular. Can you grow them in pots or containers, yes you can. Different species and cultivars will grow to different heights, so plan the planting position accordingly. The ever popular Monarda ‘Donner Wolke’ (picture right) will reach around 70cm, brilliant violet flowers in whorls held high. Matt green foliage has a fragrance, excellent for atracting butterflys and bees. 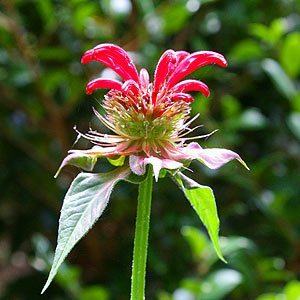 Monarda citriodora is known as Lemon Bergamot, lemon scented foliage and pink flowers. Foliage is said to be used to make tea. Monarda didyma is the ‘Scarlet Bergamot’ another tall species reaching nearly 1m, lovely scarlet flowers in spring. Mondara punctuata is known as ‘spotted bees balm’ or ‘spotted horse mint’ not as widely grown as an ornamental plant as others. The new kid on the block is Monarda ‘Jacob Kline’, an improved variety with large red flowers, brilliant. This one will reach around 80 – 100cm. Again a sunny position in a rich well drained soil. Beauty of Cobham, Croftway Pink and Mohawk are other named cultivars.